Headaches are defined as pain in the upper neck or head. The pain arises from the tissues and structures that surround the brain. Headaches are one of the most common pain syndromes and account for many lost days of work and play. When speaking with your medical provider about your headaches, you will be asked questions that will help define the type of headache you have, which will help guide your treatment plan. Cranial neuralgias, facial pain and other headaches are the 3rd category of headache. Neuralgia means nerve pain. Cranial neuralgias are an inflammation in one of the cranial nerves. Trigeminal neuralgia is a common cranial neuralgia which causes intense facial pain on one side. These “headaches” occur acutely and are generally one sided. They cause an intense, burning pain. Medical exam will show irritation of the cranial nerves. Treatment includes prescription medications like gabapentin and prednisone, which calm down the inflammation. So, if you’ve done the prompt medical exam and fall into the primary headache category, what should you do? Get plenty of sleep, hydrate and minimize stress. Lying down in a darkened quiet room helps. As does a cloth dipped in vinegar placed on the temples. Meditation and yoga also calm the body. Supplements like turmeric, cinnamon and cayenne are noted to reduce inflammation and may help. A diet high in complex carbohydrates (whole grains and starchy vegetables) and low in protein is recommended for headache sufferers. Avoid fried foods as fried fats contain aldehydes that triggers headaches. Eliminate sugars, dairy products, and nuts which contain tyramine, which can trigger headaches. Cut down on alcohol, caffeine and tobacco. Increase your intake of foods that are rich in magnesium and calcium—two minerals that prevent and relieve headaches. Examples include brown rice, wheat bran, wheat germ and soy beans. Eat a handful of almonds. Drink feverfew or ginger tea. Avoid MSG, gelatin and yeast extract. Omega 3s, like fish oil, can reduce inflammation, which may reduce headaches. Headaches are described as dull, aching, sharp, stabbing, throbbing, squeezing, or burning. They cn be constant or intermittent and are classified as mild, moderate or severe. Location of the headache also gives clues as to the cause. Does anything you do make the headache better? Worse? Is the headache worse or better at certain times of the day? Keeping a headache diary is also beneficial. There are 3 classifications of headaches: Primary headaches, Secondary headaches and Cranial neuralgias, facial pain and other headaches. Primary headaches include tension headaches, cluster headaches and migraines. Tension headaches are the most common primary headache and can usually be relieved with over the counter headache medications. They affect women more than men and can be a daily occurance. They are usually felt in the back of the head, the forehead or the side of the head called the temple. They sometimes feel like a band is squeezing your head. They are bilateral. There is no aura, nausea, vomiting or sensitivity to light. The medical exam is normal. Over the counter medications, physical therapy, massage, biofeedback and stress management are the usual treatments for tension headaches. Cluster headaches occur behind one eye and men are more affected than women. They occur daily for weeks, then disappear. They usually occur at the same time of day and may awake you at night. They tend to run in families and can be triggered by medications, alcohol, cigarette smoking, chocolate or processed foods with nitrites in them. The pain lasts 30-90 minutes and has been described as a “hot poker” to the eye. The pain can be excruciating. The physical exam is normal if not in the midst of an attack. If the attack is occurring during the exam, the eye and nose on the affected side may run and be watery. Treatment includes triptans (prescription), caffeine, reduction in alcohol consumption and smoking. Secondary headaches are usually a symptom of something else. A headache from a neck injury, or a sinus infection is an example of a secondary headache. Vision problems can also manifest as a secondary headache. Managing the primary issue will usually resolve the headache. Head trauma, dental issues, substance abuse and “hangovers” also fall into this category. Of note, overuse of pain medication can actually cause a “rebound” headache. Secondary headaches can also be a symptom of more concerning medical issues like swelling in the brain, malformation or inflammation of blood vessels in the brain, post traumatic bleeding in the brain tumors, seizures and changes in spinal cord pressures. Infection and disease can cause headaches, as well as certain medications, esp those associated with erectile dysfunction, heart problems and oral contraceptives. The medical exam is targeted to assess the cause of the headache. As some causes of secondary headache can be life threatening, you should seek medical attention promptly. 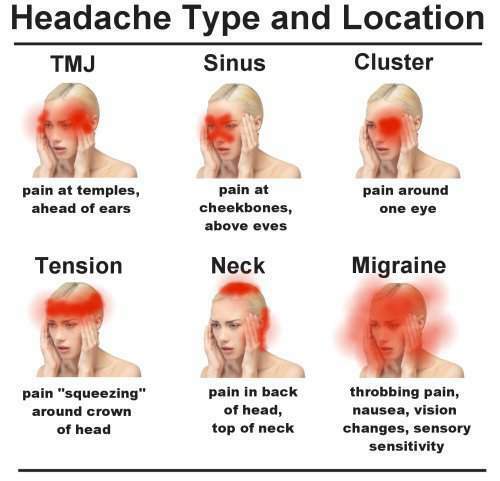 Please seek medical attention immediately for new onset, severe headaches, the “worst headache of your life” , thunderclap headache or if headaches are associated with fever, stiff neck, weakness or change in sensation on one side of the body, change in vision, vomiting or change in behavior. Here's a great juice recipe to help alleviate your headache. You can juice this or mix it in your blender for a smoothie.